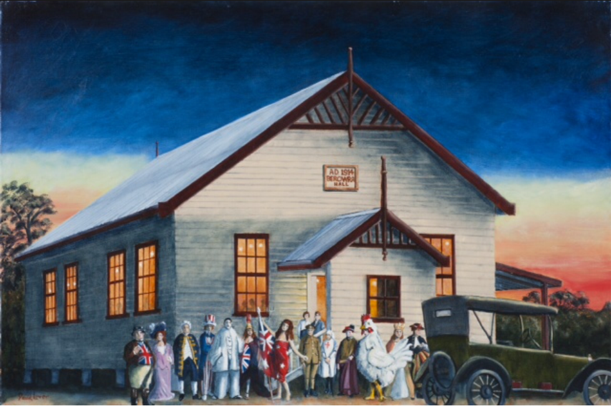 Last week, David Lever shared two of his beautiful paintings of Berowra Hall with our blog followers and, as promised, this week he returns to more closely examine the paintings and the events which they represent. The annual plain and fancy dress ball was held on Friday 2nd October 1914. The Ball was reported to be highly successful and in fact more so than those held in previous years. That raises a question as to where Balls were held in Berowra prior to the construction of the Hall. Decorations for the Hall, supper room and supper tables were along patriotic lines of red white and blue. Many beautiful and striking costumes were worn. The characters I have depicted in my painting were well described in the newspaper report enabling me to capture them in a manner in which they might have appeared. The report on the Ball named the wearers of the costumes as well as providing detailed descriptions of the gowns worn by ladies who chose not to wear fancy dress costumes. Excellent music was provided by Mrs Hewitt and Mrs Long. The engagement of Miss Maggie Chrystal, youngest daughter of Mr and Mrs . George Chrystal of “Ormiston” Goodwyn Rd. Berowra, to driver Harry Toms, A.I.F., second son of Mr and Mrs Charles Toms of Thornleigh was announced on 31st May 1919. On 23rd October,1920, their military style wedding took place at St Marks Church of England, Berowra. The ceremony was conducted by The Reverand A.L. Wade of Hornsby, the service being choral. Girlfriends of the bride decorated the church with arum lilies and marguerites. The church was filled to capacity. The bride was dressed in white charmeuse, elaborately hand embroidered , and wore a handsome bridal veil surrounded by orange blossom. The bride and bridesmaid carried bouquets of pink and white carnations tied with the grooms military colours of red and blue and were a gift of the bridegroom. The groom and best man wore their military uniforms. Members of the tennis club provided a guard of honour as the couple left the church with raised tennis racquets. They were then driven the short distance to Berowra Hall. A wedding breakfast was provided at the Hall for 80 guests. The event was celebrated with musical and singing entertainment as well as dancing. The couple received many wedding presents. Mr and Mrs Toms left for their honeymoon at Lawson. The bride was dressed in a grey outfit with hat to match. The land upon which the Hall had been built remained vacant until the early 1950’s when the current house was built by local builder George Huett. Prior to that the charcoal covered land had been a popular play ground for local children. This week Berowra Living History reflects on a building which was once central to the community. 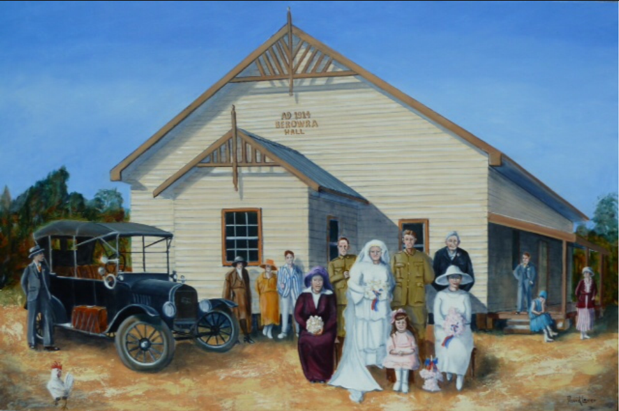 The Berowra Hall would this year be celebrating its 100th anniversary, were it still standing. David Lever, who has recreated the lost hall in two of his beautiful paintings tells a little of the story of the hall. BEROWRA HALL 1914 to 1929. It is difficult to imagine that during the years 1914 to 1929 a thriving centre of social and cultural activity existed on the site of what is now 27 Berowra Waters Road. This was the site of the first Berowra Hall. The hall was completely destroyed by fire at about 10 am on Saturday , Christmas Eve 1929. The building, constructed of a timber frame, weather boards and a highly waxed floor burnt very quickly and was impossible to save. The last activity held in the hall the night before was a card game played by local residents. The construction of the hall was financed by Berowra residents who purchased shares for ten pounds each. Share certificates were issued and Hall events were managed by a Board of Directors. The managers were Charlie Woof, George Huett and Jack Foster. A minor matter of interest is the paving of a footpath outside the hall. The Berowra Progress Association argued that the extensive drop from the path to the gutter presented a danger to the Councils President and other Councillors when visiting the hall. The resulting small section of footpath resulted in the first section and for many years the only section of paving in Berowra. To date only two photos of the hall have emerged and both show the building in an advanced stage of destruction by the fire. Curious to know what the building might have looked like, I was luckily able to obtain enough information from those two photos to paint two images. I believe these two paintings represent the building with a reasonable degree of accuracy. Berowra Hall was regularly used during its lifetime. It hosted a wide range of activities and they included: an annual dancing season commencing in March, fetes, roller skating annual balls, wedding breakfasts, silent movies and farewells to departing soldiers as well as returning soldiers during World War 1. I chose two of those many events to represent in the paintings. Information about both events came from The Cumberland Argus and Fruitgrowers Advocate which was based in Parramatta. Come back next week to find out more about these events and the paintings which recreate them! 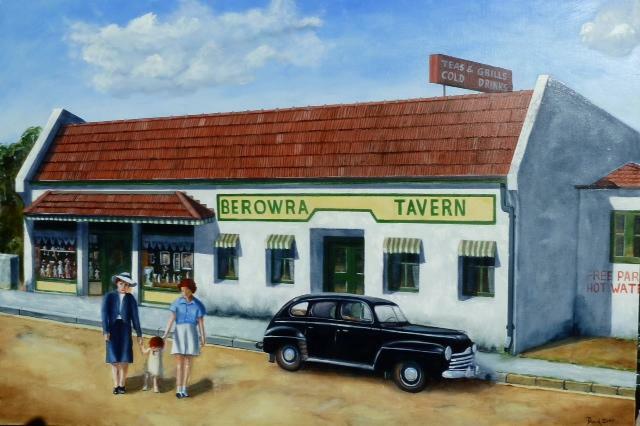 If you look closely at David Lever’s painting of what was the old Tavern on the Pacific Highway, Berowra, you may be able to see the reason for our blog title! While the Tavern of yesteryear was the hub of many activities like dances and school concerts it apparently also attracted attention for another reason. Long time Berowra resident, Pam Gartung has fond memories of Mollie Dwyer and her great skills at knitting and sewing. Mollie features in the following extract from Worth Reporting on p.38 of The Australian Women’s Weekly of 26th November, 1949. At the time this popular magazine cost sixpence! MOLLIE DWYER, of Berowra, N.S.W. has turned her childhood hobby of dressing dolls into a business. She makes baby clothes and exquisite dolls’ frocks, which are shown in a window of the Berowra Tavern where tourist buses stop each day. Hungry tourists have even been known to miss afternoon tea through spending too long gazing at Miss Dwyer’s handicraft. Dresses are of the finest organdie or marquisette, appliqucd with hand-made medallions or sometimes with lace. Frocks and underclothes unfasten and can he laid out for ironing. But not all the dolls wear summer dresses. Many are dressed in finely knitted wool. “I do the knitting on hatpins,” said talented Molly Dwyer. This article is accessible through TROVE. Last week I had the privilege to view an exhibition of paintings by Berowra artist David Lever at Macquarie University Art Gallery. The paintings brought to life some of the history of the people of Berowra and Sydney and the buildings and streets. I was brought back to my childhood and memories flooded back as I gazed at Foster’s Store, Berowra railway station, and the old Berowra Tavern. I remember travelling with my family in our old 1926 Chevrolet en route from our home in Hornsby to the family orchard at Cowan. We always stopped at Foster’s Store to collect necessary supplies – groceries, milk, bread and farm implements etc. and probably a few packets of Log Cabin tobacco for my father’s pipe. I always gazed longingly at the wonderful display of dolls in the shop window. Inside the store there was an amazing variety of lamps, boots, tins of biscuits, shovels, and saws etc. —all important items for our working weekend at the citrus orchard at the end of Glendale Rd. The old Berowra Tavern also had, among other things, a display of dolls. I have many happy memories of the many hours spent picking lemons, packing, turning the handle on the lemon grader, wonderful dinners, heaps of passionfruit and many walks amongst the beautiful wildflowers and fishing in Joe Crafts creek. The paintings by David have recaptured many treasured moments. There is scant photographic evidence of the railway station and general store in this early period of Berowra’s history. But we do know that a Mr. Robert Richards was the first proprietor of the general store in Berowra. In a newspaper reference dated December 1903 Mr. Richards store is also listed as a place to vote. By 1909 Mr. Richards proceeded to inquire about the possibility of relocating the post office, then based at the railway station, to his store approximately 100 metres up the road. 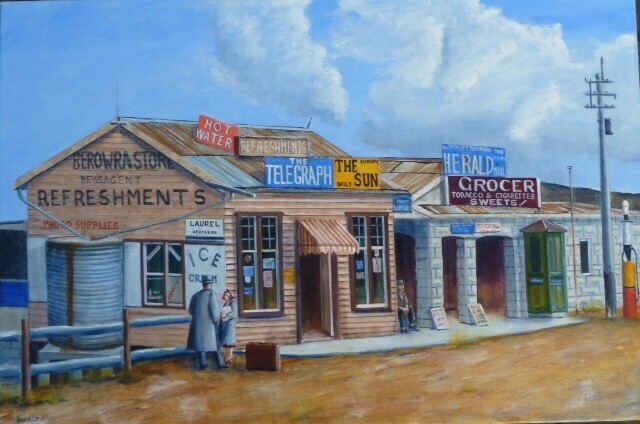 Mr. Richards store is now brought to life in David Lever’s latest painting which is included in a current exhibition of his works titled ‘History in Colour’ at Macquarie University Art Gallery. The exhibition opens on Thursday 5 December. Lever’s visual depiction sets the scene – imagine going back in time to walk through the doors of this – by local standards – legendary store. It later became well known and loved as the Foster’s Store. As we can see it’s a charming rustic building and as time went by it became the hub of Berowra. The goods shed illustrated in the middle ground of the painting was once a hive of activity – important to the local industry. It not only received goods from Hornsby but also received produce from Arcadia for transport into the Sydney markets. Akin to the historian, the artist David Lever utilises methods for tracking down difficult to locate records in splendidly capturing a place and period that opens up the past in a beguiling way – history in action as a living, breathing force. Lever visually recalls how people once lived and went about their daily business in Berowra. 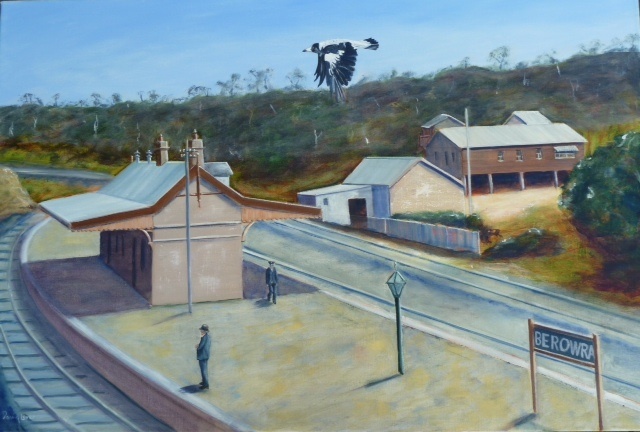 The ubiquitous magpie flies nonchalant above the railway station – synchronised with the narrative of the everyday. The visual rendering of the buildings appears integral within the surrounding natural landscape. The painting has an arresting silence, which encapsulates the viewer. Who would ever imagine a historic restaurant menu being discovered like hidden treasure in a modern day restaurant? Well, this is what happened recently when the current owner and Head Chef, Brian Geraghty of Berowra Waters Inn found this menu in the attic. The menu is dated to 1938, from a time when the restaurant was called the Riverview Guest House. Established in 1926, the Riverview was run by Millie and Dan Cullen and, like Berowra Waters Inn of today, was famous for producing a sumptuous lunch for tourists charting the river. Many tourists would arrive at the Riverview tea house via a boat called the Enterprise. We can see this Special Tourist Luncheon, priced at two shillings and sixpence (about $5 in today’s currency) was great value for money, including oysters on the shell, followed by a serving of fish and mashed potatoes. Some things have changed – chips replacing the humble mashed spud. 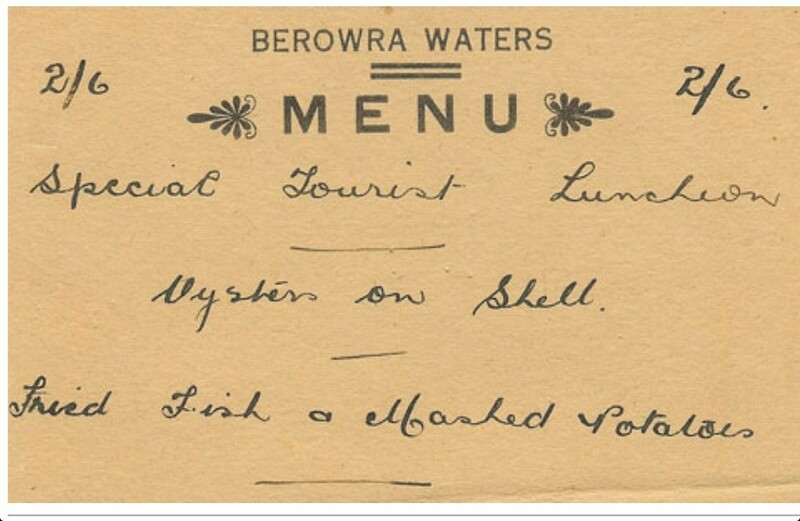 The original menu also sparked Geraghty in creating his own special tourist luncheon at Berowra Waters Inn which naturally includes oysters and fish. We think it might be worth a visit if you plan to chart the beautiful Berowra Waters this summer. 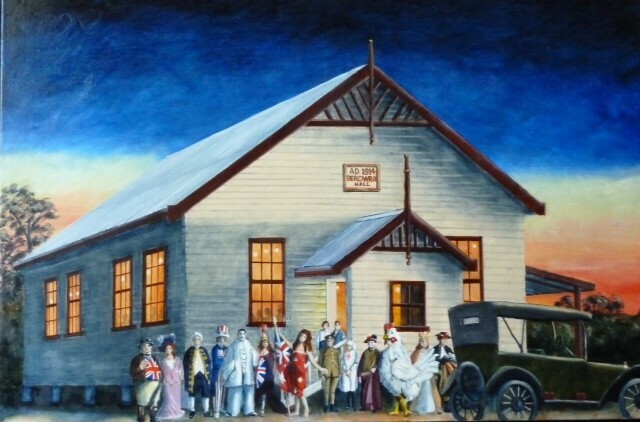 This painting by David Lever shows a recreation of the Plain And Fancy Dress Ball that took place at the Berowra Hall in October 1914. With the exception of the white leghorn, the varieties of costumes illustrated in the work are drawn from representations accounted for in a newspaper report covering this dazzling event. Set against a fiery night-scape, the painting offers a visionary aspect that lends a surreal ambiance to what may be perceived as an otherwise sedate Berowra setting. Prophetic, the work alludes to the dreadful fate of the hall which burned to the ground the following month in November, not long after this celebratory ball took place. If you would like to see more works by David Lever, please visit his website. People gathering around the local or corner shop prolonging their stay to engage, gossip and exchange information was a familiar scene throughout Australia during the inter-war period. The Fosters store in Berowra epitomised one of those places. It was a store that stocked almost everything that a household required in those days from bread, butter, cheese and meat to hardware, petrol and farming equipment and much loved by the local children the lolly jars that flanked the shelves. An easy stroll to the Fosters store was part of the daily routine for most living in Berowra. If you were unable to make the store Bill Foster would deliver your goods to your doorstep each day by horse and carriage. All you needed to do was ring your order through the day before and Bill would have the order ready the next day. Being situated right near the railway station the Fosters store would hang a tea towel on the back of the shop to warn train travellers about ticket inspectors being at the station. The store was also the location of the Berowra telephone exchange, bank and postal services in addition to the Post Office located along Berowra Waters Rd. David Lever has vividly captured the experience of living in a small rural community like Berowra during the 1930s – transporting us, the viewers, into a time and place where everything seems to stand still. The women are depicted in various roles from mothers with their small children to women gossiping, an easy slow pace far removed from what we experience today in the very hectic and at most times stressful car park at Coles Berowra. Bill Wall’s bus is depicted in its glorious state being one of the main transport vehicles during this era. Wall was able to adapt the back of the truck so the vehicle could carry passengers from Berowra Station to Berowra Waters which became a much needed service as tourism increased within this area throughout the 1930s. But what intrigues me the most about this image is the character placed strategically in the foreground of the picture. His city style hat looks very sophisticated paper slipped under his arm with cigarette hanging from the mouth in a very cool and unassuming way. This character seems somewhat familiar – as if cast from a film set and transported into the sleepy town of Berowra. Is he observing the others in this tableau or are the others watching him with hesitation and suspicion. This extraordinary history painting affords us ways of looking at life in different ways and how it plays out on a daily basis which transcends time and place. David Lever has provided us a unique insight into Fosters store which was once the heart of Berowra. Over the last five decades Berowra artist David Lever has embarked on a fascinating journey to know the social, cultural and built environment history of Berowra. In 1995, after retiring from the workforce David took up painting under the master tuition of one of Australia’s leading artist’s Garry Shead. David’s abilities as an artist soon became apparent and before too long he produced with great ardency a series of paintings based on the history of Berowra. David has vividly captured the essence and atmosphere of Berowra that prompts within the viewer the urge to look much deeper within each painting. The works have a slight cinematic feel that places the viewer within the imaginative field of the painting convincing in its unfolding narrative. 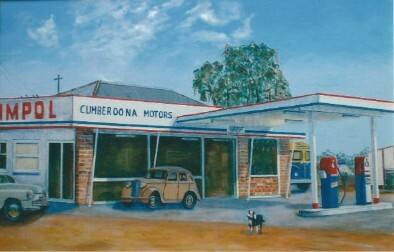 The painting shown here of Cumberoona Motors is now the site of the BP Garage in Berowra. David has set the scene in the mid ‘60s when the garage was owned by the Corrigan family. 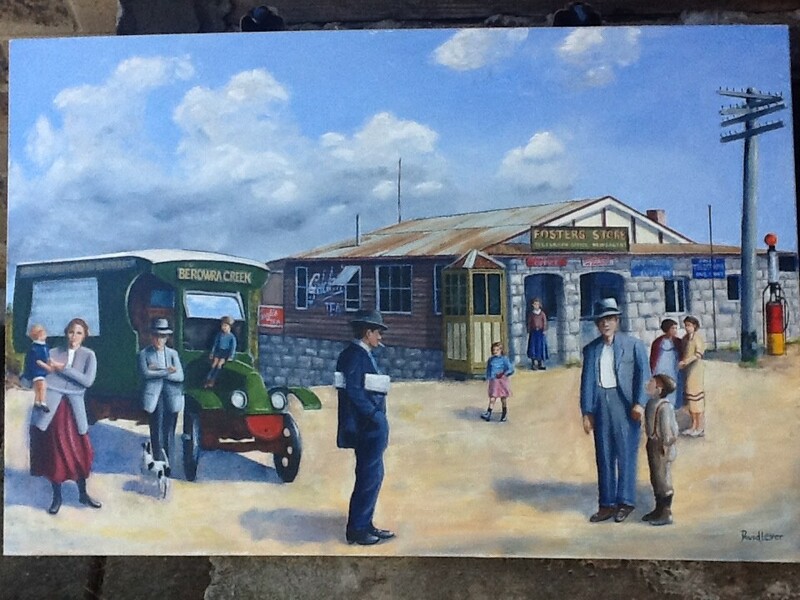 Seen in the background of this painting is one of Corrigan’s buses, the local bus company which serviced the entire Berowra community. There was a small flat attached to the back of the garage which was called the Wombat Flat. Various family members lived there. David is recording history that draws upon the way a community has interacted with the environment and how those places and sites he so finely depicts becomes part of Berowra’s Living and evolving History. David Lever’s Berowra series of paintings will be released on this blog over the forthcoming period, so don’t miss the next instalment.